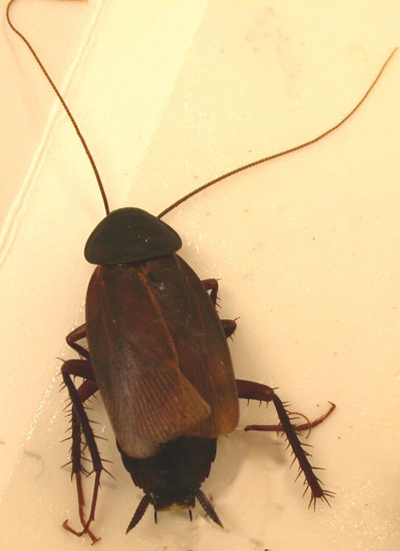 The cockroach is one of the most common urban pests found in human dwellings all over the world, especially in multi-family housing units. Many people feel frustrated or do not know how to properly get rid of cockroaches. Here, we provide some basic information about cockroaches and simple steps to eliminate cockroach infestations. Cockroaches walk everywhere in the house, drop feces, and spoil food. They shed their skins as they grow and also produce unpleasant smells when their numbers become large. Prolonged exposure and inhaling allergens from their skins and feces can cause allergies and asthma. Children can easily get cockroach-caused allergies and asthma. In Indiana, the most common cockroach species in houses is the German cockroach, which is actually found worldwide. The adult German cockroach is about 1/2 to 5/8 inch long. There are two dark stripes on the anterior, dorsal portion of the thorax. In Indiana, another cockroach species occasionally found inside houses is the Oriental cockroach, sometimes called a “water bug” or “water beetle.” Its length is about 1-1/4 inches for the female and 1 inch for the male. It is dark brown in color. Cockroaches have three life stages: egg, nymph, and adult. The eggs are packed in an egg capsule and carried by the adult cockroach until hatched. Each capsule contains 30-48 eggs. The nymphs shed their skins 5 to 6 times before they grow into adults. The adults have wings, which distinguish them from nymphs. It takes from 40 to 125 days for an egg to mature into an adult. Each adult female can produce 4 to 8 egg capsules. The adult cockroach can live up to a year. Cockroaches eat many kinds of materials. They are especially fond of starches, sweets, beer, and meat products. They also feed on leather, bakery products, flakes of dried skin, dead animals, and plant materials. Cockroaches hide in dark narrow cracks and crevices. They tend to gather in corners (in the back of cabinets or drawers, for example) and generally travel along edges such as baseboards. They are most active during the night. You can avoid cockroaches coming into your home through the following three simple steps. Check for cockroaches before bringing home containers (such as paper bags) from the store. Seal holes or crevices around walls or doors. Cockroaches can travel from neighboring apartments and rooms to your home through holes and cracks. Clean the floor frequently. Wash dishes promptly after meals. Cover food containers, pet food containers, and garbage containers. By eliminating their food, water, and hiding places, you can prevent cockroach infestations from occurring. Use of various tools to kill cockroaches and continued monitoring and treatment as needed. All of these procedures are essential to maintain a cockroach-free living environment. The simplest method to monitor cockroaches is to visually inspect cockroach hiding places using a flashlight. Places such as behind the refrigerator, under the sink, crevices in cabinets and shelves, closet door corners, and bathroom cabinets and closets are especially important. If you are still not sure about the cockroach infestations after a visual inspection, you can use the following monitoring tools. 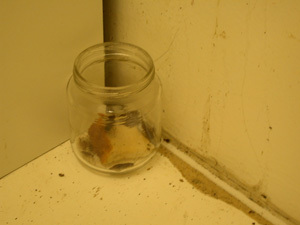 A baby food jar with the inside upper portion lightly greased with petroleum jelly is a simple tool to locate the cockroaches and determine level of infestations. It also helps reduce the number of cockroaches. Place a piece of bread soaked in a small amount of beer in the jar to attract the cockroaches. A variety of glue board traps are available from the supermarket for pest control. They are useful for cockroaches, mice, and other crawling insects. Some traps have special smells that help increase the trapping efficiency. Traps can be placed in cabinets above and under the sink, beside the stove and refrigerator, and in the utility room and bathroom along a wall or in corners. At least six traps should be placed in a home to monitor the cockroaches. Chemicals (insecticides) are still widely used and often necessary to get rid of cockroaches. When choosing an insecticide, you need to consider its effectiveness, convenience, and safety. Remember that although they are effective, you almost always need to use a combination of different methods to reach complete control. Here are two popular methods you may consider. They come in a syringe. 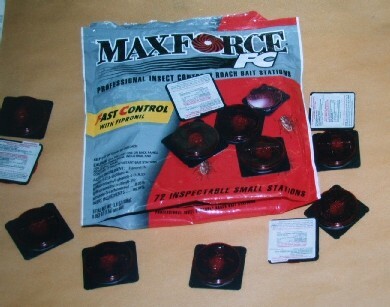 There are several brands available, such as Combat, Maxforce, Avert, and Siege. Apply numerous spots at cockroach hiding places or active areas. Each spot only needs a pea-size amount. In areas where large numbers of roaches exist, a peanut-size amount of gel may be needed at each spot. The bait is located in a secure plastic housing. It is safer than gel baits since children or pets will not likely contact the bait. 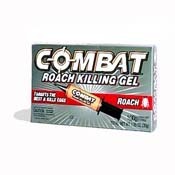 The bait is physically harder than gel and is not readily accessible by the roaches compared with the gel bait due to smaller number of placements. Therefore, bait stations may need longer time to kill the roaches. They are also more expensive. 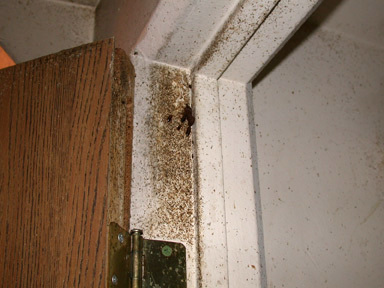 Dust made of boric acid can be applied behind stoves, refrigerators, and other cockroach hiding places for long-term management. The dust remains effective as long it stays dry. Use boric acid dust sparingly to avoid unnecessary contamination. Apply insecticides to all areas where cockroaches hide. Check 1-2 weeks after initial treatment, and apply more if necessary. A combination of bait and dust may provide the best results. 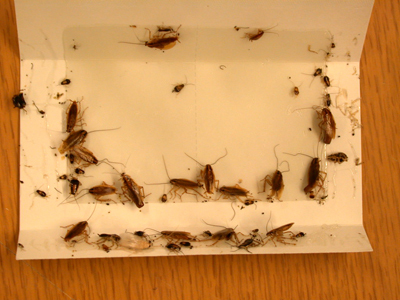 In most multi-family units, cockroach control is performed through contracts with pest control companies. But good control cannot be achieved without cooperation among residents, management staff, and the pest control company. Reduce clutter and clean out closets, drawers, and cabinets regularly. Enforce a minimum level of sanitation in apartments. Report conditions that need to be improved. 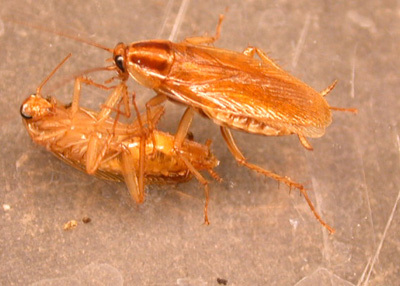 Many Web sites provide information on cockroach related issues. The following Web sites are recommended for cockroach related topics. Environmental Health Watch <www.ehw.org/>: A not-for-profit public interest organization located in Cleveland, Ohio. U.S. Environmental Protection Agency <www.epa.gov/pesticides/controlling/resources.htm#residents>. U.S. National Pesticide Information Center <www.npic.orst.edu/>.